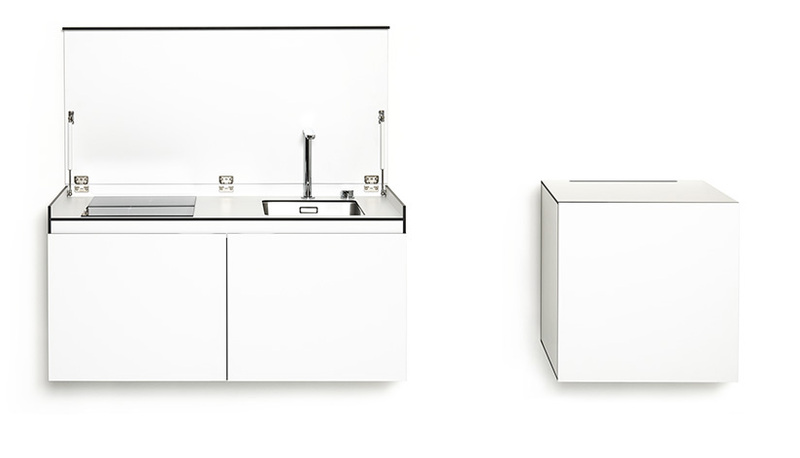 miniki slimline – the invisible kitchen disguised as an elegant sideboard. miniki slimline can become »invisible« on demand. Its ability to transform itself into an understated sideboard makes it ideal for small residential and business premises with an integrated kitchen area. miniki slimline is made of white HPL (high pressure laminate) with a black core. The closed, pore-free surface is waterproof and heat-, shock- and scratch-resistant for easy maintenance and long life. The perfect material for the highest demands. 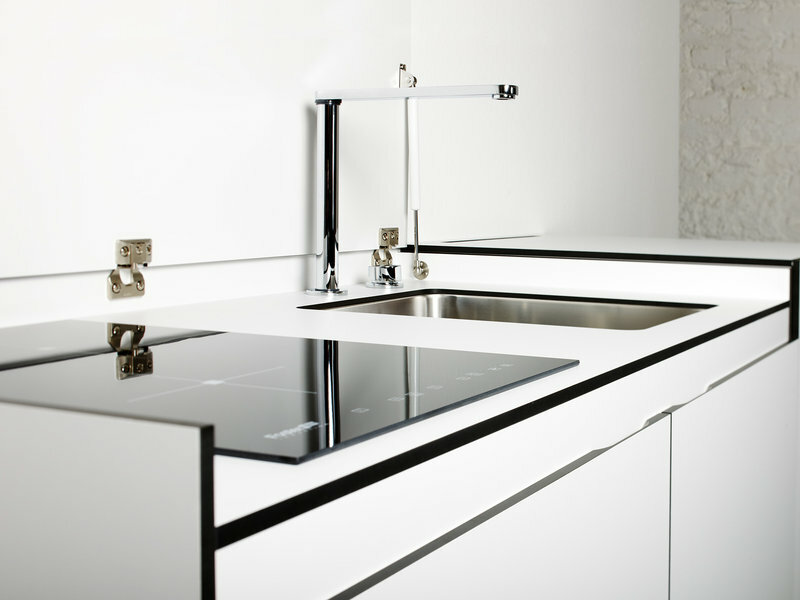 Based on two different basic modules (sl 1 and sl 3), with sink and either with or without an induction cooktop, the slimline can be individually configured and adapted to every need. An extra cabinet, a fridge module or an oven module can be added to either side. Each module is 60 cm wide (double module sl 1: 120 cm). 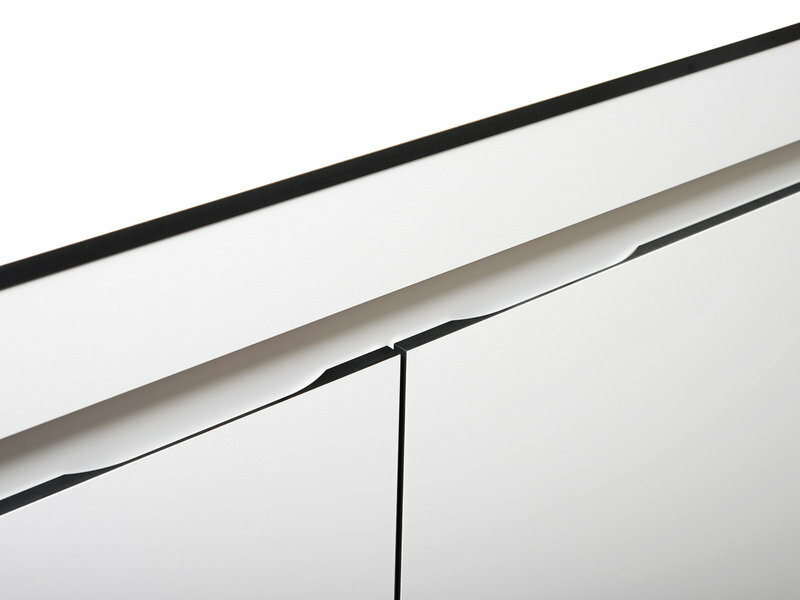 For maximum flexibility, the door hinge of module sl 3 can be set at either side. This means that there are no limits to the possible combinations. 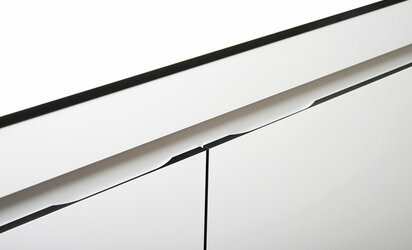 The modules can either be attached directly to the wall as an elevated sideboard or placed on the stylish base. Modern nomadism is replacing the throwaway society! The miniki slimline is a future-ready answer to the urgent issues and challenges of making society more environmentally responsible despite its increasingly nomadic members. To meet this claim, each slimline is conscientiously manufactured in Germany and equipped with high-quality parts. The minimalist design of this compact kitchen will outlive every passing trend. Modular and readily combinable, the slimline is easy to adapt to changing living or working situations.